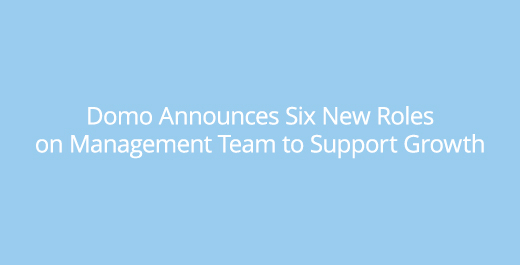 SILICON SLOPES, UTAH – March 21, 2016 – Domo today announced it has added six new roles to its executive management team to support the company’s aggressive growth. Two positions were filled with new hires and four were filled by members of Domo’s executive staff. Domo’s two new hires include Peter Black as senior vice president of enterprise sales and David Thompson as chief strategy officer. Peter Black brings more than 25 years of sales leadership to Domo where he is responsible for growing the company’s base of Fortune 1000 customers through optimizing a high-performance sales organization. Black joins Domo from SAP North America where he led SAP’s procurement business. Previously, he spent six years in leadership roles at Ariba, last serving as senior vice president for North America. There he was an instrumental force in achieving record-setting triple-digit growth for the region. Prior to Domo, Thompson spent more than 25 years running sales, marketing and overall business operations for multiple Internet businesses. He served as longtime CMO of WebEx, where he named the company, helped create the cloud-based conferencing category and positioned the company for its IPO and subsequent buyout by Cisco. He also co-founded and served as chief executive officer of Genius.com, a leading SaaS marketing automation company which was acquired by CallidusCloud in 2014. Three Domo executives have taken on the remaining four roles. Catherine Wong has been named chief product officer, Matt Belkin has been named chief analytics officer and general manager of a new division to be announced at Domopalooza, and Mark Dillon has been named senior vice president of channels. As chief product officer, Catherine Wong is responsible for Domo’s complete product organization – engineering, user experience and product management. Daren Thayne, Domo CTO, is focused on strategic partnering, spending critical time engaging and consulting with customers, as well as overseeing Domo Labs, focusing on radical innovation for customers. He is also responsible for Domo’s technology infrastructure. As chief analytics officer, Matt Belkin will ensure Domo is best in class in leveraging data and analytics to drive business performance, with the ultimate goal of sharing these best practice solutions with Domo’s entire customer base. Matt also was named general manager of a new division to be announced at Domopalooza. Rounding out the six new positions, Mark Dillon was named senior vice president of channels, an important role as Domo begins to expand beyond a direct sales organization and empower a worldwide channel organization. Domo transforms the way business is run. Domo gives CEOs and decision makers across the organization the confidence to make faster, more effective decisions and improve business results by giving them one place to easily access all the information they need.